Ah, the kids are back in school and it's the half term that runs up to Christmas. It's always a busy time - Christmas Fayre at school, so books and unneeded things to dig out and it's my eldest son's birthday in early December so lots of things to think about. This year, now he has a good group of friends, he's having a paint-balling party. One thing we won't have to worry about this year though is the neighbourhood Christmas party, because we did it last year, so it's definitely not our turn. 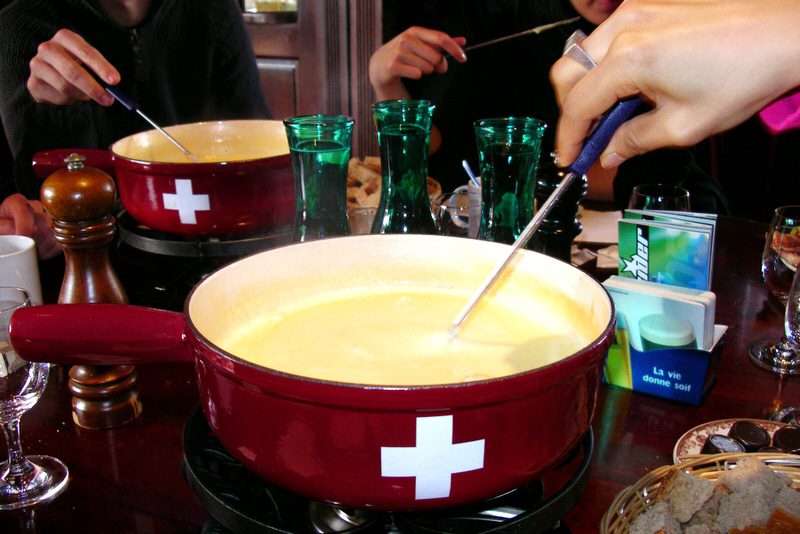 Cheese Fondue.. just not like ours. We live down a dead-end, un-paved lane, hidden away on the edge of a town. We have lovely neighbours - families like ours and older couples whose children have flown the nest long ago. So last year, I bought in everything I might need - stocked up ahead of time, taking advantage of supermarket offers. We decided to make it a bit retro and do a cheese fondue. One of Jamie Oliver's Christmas magazines that I ferret away each year had a nice looking recipe, "Easy Cheese Fondue", so I checked out the ingredients and made sure we had everything in. We even had a genuine seventies fondue set, courtesy of my in-laws. How hard could it be? The night arrived and I was super-organised - everything ready except the last-minute fondue. I had a nice table arrangement with candles, which we lit. The boys skulked about, not sure if they were looking forward to the party or not. They knew all the guests and the kids - no nasty surprises - but still, they aren't used to lots of people in their home space. I put my eldest in charge of entertaining the children, as he is the oldest child in the lane. Thankfully, they perked up and planned some things. Now for the fondue!. Following the directions to the letter, we lit the meths in the fondue burner and added the Cheddar, Gruyere and Blue cheese to the other ingredients, stirring gently. For a while, it was looking good. It was difficult to control the burner underneath but we did our best. Then, I started to smell burning. I looked up from the toxic waste that had been cheese fondue. To my horror, the burning candles had set the Christmassy centrepiece alight and it was on the table, engulfed in flames. I shrieked loudly enough to make even the boys think there was something worth investigating. Leaving the solidifed cheese fondue, I grabbed the base of the burning centrepiece, opened the double doors in the kitchen that leads to a patio area and hurled it into the snow that still lay on the ground from earlier in the day. I grabbed a few handfuls of snow and threw them on top of it to extinguish the flames. Fortunately nothing else had caught alight inside the kitchen, which was lucky as there are sheer voiles hanging only inches away. As I opened up the double doors fully to let the acrid smell of burning pine cones out, the doorbell sounded and the first guests arrived, trudging up the path in their wellies. Our across-the-lane neighbours had brought their slippers to change into - see, that's what nice about neighbourhood gatherings, no need to dress up! Everyone came and a good time was had by all, with rest of the evening passing off without incident. Even the dog was well-behaved. A word about your underwear, Madam..